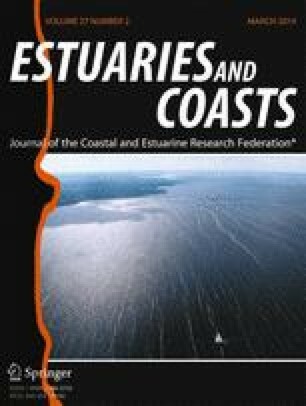 A long-term (1948–2010) shoreward energy history of upper tidal shorelines in lower Chesapeake Bay was developed using a simple calculation of kinetic energy from corresponding wind and tide data. These data were primarily used to determine the likelihood of shoreline energy increases coincident with local sea level rise. Total annual shoreward energy ranged from 620 kJ/m of shoreline in 1950 to 17,785 kJ/m of shoreline in 2009. No clear linear trends are apparent, but mean annual energy shows an increase from 2,732 kJ/m before 1982 to 6,414 kJ/m since then. This increase in mean energy was accompanied by more numerous spikes of comparatively higher annual energy. Shoreward energy delivered to lower Chesapeake Bay’s upper tidal shorelines was enabled by an increasing amount of time per year that tidal height exceeds mean high water, accompanied by increasing heights of tidal anomalies. An index termed the Hydrologic Burden was developed that incorporates the combination of time and tidal height that demonstrates this increasing trend. Although opportunities for greater shoreward energy increased as the Hydrologic Burden increased, and even though there is evidence that greater energy was delivered to the shorelines during the latter time series, energy per hour delivery was shown not to have increased, and may have decreased, due to a steady reduction in average wind speed in lower Chesapeake Bay since the mid-1980s. Energy delivery in lower Chesapeake Bay was primarily from the northeast, and energy delivery over the time series is shown to organize symmetrically around a point between the northeast and north–northeast directions. This is evidence of a self-organizational phenomenon that transcends changes in local wind and tide dynamics. I am grateful to Valerie Woodard, Donna Milligan, Scott Hardaway, Tiffany Backer, and Gary Anderson of the Virginia Institute of Marine Science for data management assistance. I am indebted to John Billet of the National Weather Service in Wakefield, Virginia and Dr. John Hoenig of the Virginia Institute of Marine Science for guidance on particular data analyses. I also thank the reviewers, whose contributions greatly improved this paper. This paper is Contribution No. 3294 of the Virginia Institute of Marine Science, The College of William and Mary. Knudsen, M.F., M.-S. Seidenkrantz, B.H. Jacobsen, and A. Kuijpers. 2011. Tracking the Atlantic multidecadal oscillation through the last 8,000 years. Nature Communications. doi: 10.1038/ncomms1186.